I can't believe this is my final A to Z post. I can't believe I actually made it through the whole challenge. I can't believe how many great new-to-me blogs I've discovered. I want to thank all of you who have visited me throughout April. I've loved getting to know you through the comments you've left for me. Every post I've written for this challenge related to homeschooling, but that's not the only thing in my life. With 5 small people who are active in sports, scouts, and dance, there are many days that I feel as if I live in a zoo. It provides me with many more things to blog about than just homeschooling. So I hope you'll stick around. I live in a zoo, too! (and I only have 2 so far!) haha! Enjoyed your A-Z posts! Will definitely return! Oh I know just how you feel living in that ZOO! 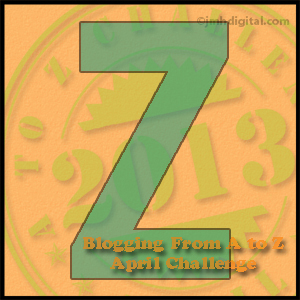 have enjoyed your A-Zchallenge! Congratulations on completing this challenge...you did it! From one zookeeper to another. Or are we ringmasters? Anyhoo...get some Zzzz's now! I hope they aren't throwing poo around like chimps do in zoos. And what a darling zoo it is! Congrats on finishing the A-Z!! Congratulations on finishing the A to Z challenge! I know that feeling. I think everyone has the image of homeschooling parents sitting at home watching their kids do maths problems! I only wish we had some time at home. Seems like we're out every day at something or other, and I only have one child!